PACER’s Simon Technology Center is thrilled to add some new, cutting edge technology. The STC Lending Library has launched a new modern online catalog of items! Reserve, check-out, or renew items online, by phone, email or in person. This two-hour hands-on workshop will introduce teens (boys and girls) with disabilities to the fundamentals of coding through the use of MIT's Scratch online software. 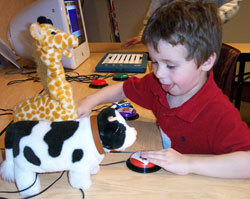 Teens will create interactive games and stories while developing basic programming skills. This workshop is designed for students with basic computer skills, but no previous coding knowledge is required. Students of all abilities are encouraged to attend. The Simon Technology and its projects are generously sponsored by private donations and the following foundations: 3M, Best Buy, Boston Scientific, Donaldson Foundation, Ecolab, Fred C. & Katherine B. Andersen Foundation, Grotto Foundation, IBM, Medtronic, Minneapolis Rotary Community Service Foundation, The Minneapolis Foundation, Schulze Family Foundation, Verizon, and Xcel Energy. In kind support provided by Accenture and Target. PACER's site offers many PDF files for download, which require Adobe Reader to view. ©2018 PACER Center, Inc.